Posted on 8, April 2019 by EuropaWire PR Editors | This entry was posted in Business, Chemicals, Financial, Germany, Investment, Management, News and tagged challenging market environment, digital transformation, digitalization, diversity, dividend increase, Dr. Simone Bagel-Trah, FY 2018, growth opportunities, Henkel, Henkel 2020+, Henkel Annual General Meeting 2019, Henkel dividend in FY 2018, Henkel earnings, Henkel Full-year outlook 2019 confirmed, Henkel FY 2018, Henkel profitability, Kathrin Menges, plastics, social responsibility, Sylvie Nicol. Bookmark the permalink. DÜSSELDORF, 8-Apr-2019 — /EuropaWire/ — Henkel is holding its Annual General Meeting today in the CCD Congress Center in Düsseldorf/Germany. Key developments of the fiscal year 2018 as well as what progress has been made in implementing the company’s strategic priorities have been presented by Henkel CEO Hans Van Bylen. Focus has been put on the growth initiatives the company has announced at the beginning of the year. Hans Van Bylen pointed out at the highest dividend ever paid in the company’s history and the outlook for the current fiscal year 2019 has been confirmed as well. Acknowledging the achievements of the Management Board and the employees in the fiscal year 2018, Dr. Simone Bagel-Trah, Chairwoman of the Shareholders’ Committee and the Supervisory Board, thanked them. Kathrin Menges, having spent more than 20 years with Henkel, has also been acknowledged and thanked by Hans Van Bylen and Dr. Simone Bagel-Trah. She has been a member of the Henkel Management Board since 2011, responsible for Human Resources, Infrastructure Services and Sustainability. Sylvie Nicol will succeed Kathrin Menges in the Management Board on April 9, 2019. The Annual General Meeting was presented with a dividend increase proposal. The dividend increase proposed is 3.4 percent for both share classes to 1.85 euros per preferred share and 1.83 euros per ordinary share. This increase represents a new record level for dividend paid by Henkel. In this regard, Henkel has announced to increase the bandwidth of the dividend payout ratio to 30 to 40 percent from previously 25 to 35 percent. According to Hans Van Bylen, Henkel continues to operate in a challenging market environment which is characterized by uncertainties and volatility. 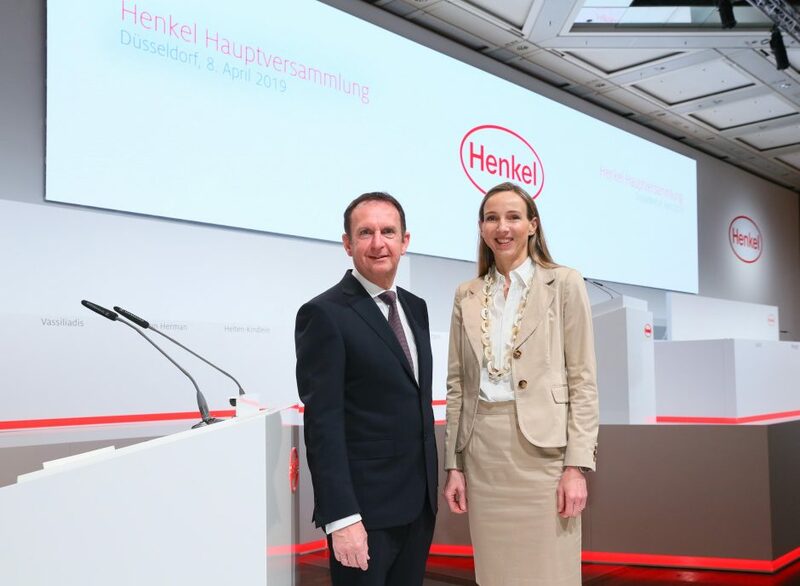 Confirming the outlook for the fiscal year 2019, Hans Van Bylen added that the organic sales growth, Henkel expects, is of between 2 and 4 percent. The adjusted EBIT margin for Henkel is expected to be in the 6 to 17 percent range while the adjusted EPS development is expected to be in the mid-single percentage range below prior year at constant exchange rates. To realize these goals, Henkel will step up investments by around 300 million euros annually from 2019 onwards. The responsible use of plastics is of a particular focus for Henkel. The company’s ambitious goals in this area are fully recyclable packaging and a higher proportion of recycled plastics. Henkel is also deeply involved in projects like ‘Plastic Bank’ and the ‘Alliance to End Plastic Waste’. According to Hans Van Bylen, however, a solution to this challenge could only be achieved together. “We operate in over 100 countries around the world and we promote diversity within the company. For us, having a diverse workforce is a clear success factor. This relates not just to different nationalities and cultures. But also to the proportion of women in our workforce. “Here, Henkel holds a top position in the DAX,” added Hans Van Bylen.